Casa Veranda is lovely, detached house, located on the edge of the village Lazi in one of the greenest area of the central part of Istria. Village is surrounded with fruit orchards and wineyards, with panoramic view onto the most pictoresque medieval town of Istrian innland - Motovun. 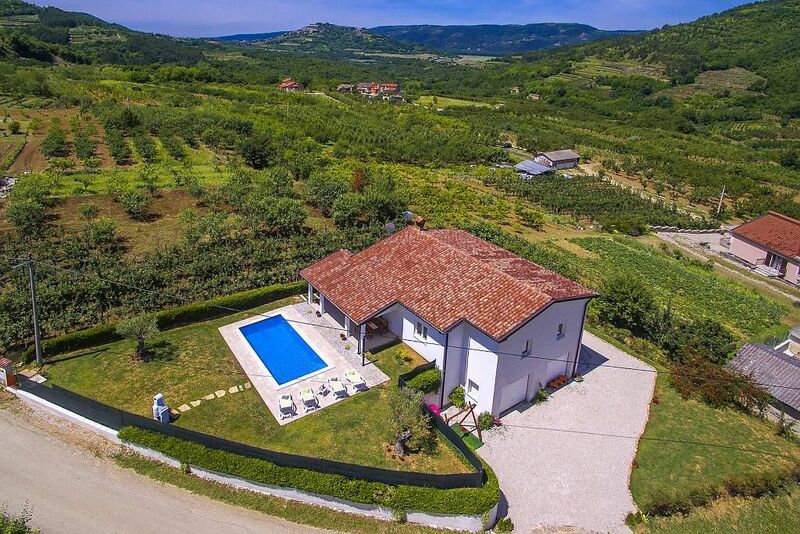 Near the house there is well known agrotouristic household Stefanic and in the 2.7 km distant Kaldir one of the most famous wine cellars of Istria, Benvenuti. Casa Veranda is completely fenced property with outdoor pool of 21 sqm, tended lawn, covered terrace with outdoor dining area, barbecue and two parking spaces. House itself extends on 90 sqm and consist of: living room with well equipped kitchen and dining area for 6 persons, sofa bed with one extra possibility for sleeping, one double bedroom, two single bedrooms, one shower/toilete and one separate toilete. Pet (per property and day, included in price 7 EUR).